Pokémon Evolved Spinner Luggage | Nerd Much? Even Meowth is included, dancing mischievously behind Squirtle. The Pokémon Evolved Spinner Luggage is the perfect carry-on, measuring exactly at 20 inches tall, 13.25 inches wide, and 9 inches deep. Though they might seem to get smaller every year, this spinner is going to stand out against all other carry-ons. 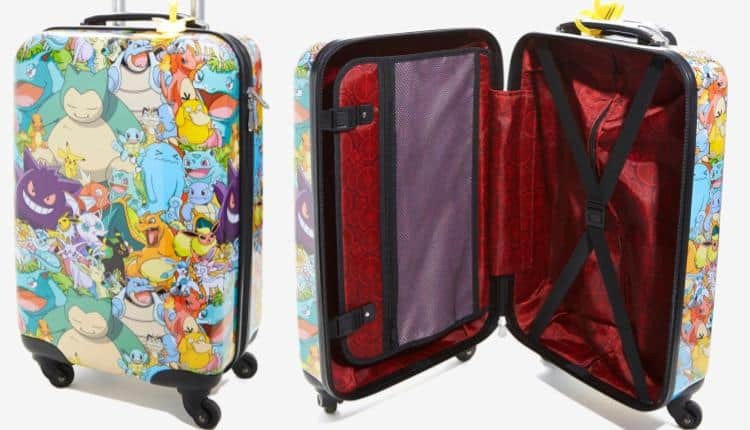 The front pattern of the Pokémon Evolved Spinner Luggage features all first generation Pokémon like Slowpoke, Charizard, Pikachu, Squirtle, and many more. Even Meowth is included, dancing mischievously behind Squirtle. The pattern also includes the various evolved forms of the Pokémon, but not all of them. Meowth and Psyduck, for example, do not have evolved forms that change their appearance. Charizard however, is shown all three forms, as is Bulbasaur, Eevee (all forms), and Jiggleypuff. The Pokémon Evolved Spinner Luggage is currently on sale for $104.92 USD with an original price of $139.90 USD. It comes with a Pikachu shaped luggage tag, on the off chance something as colorful as this is lost. It is possible, of course, as not every airline is perfect, nor are the humans that handle your luggage. The interior is standard for hard cases, with a divider that buckles down to the bottom section. There is a mesh pouch on top of the divider for anything extra you might need to have separated from your clothes or whatever you choose to pack. The top half has the usual cross strap buckle for extra squishing and compacting abilities. There is also a zipper where you can pull out the interior lining and place something like shoes or dirty clothes. Keep in mind that this is not waterproof and certainly not as durable as a Samsonite. If you’re looking for something that can be thrown across a busy highway without much damage, this Pokémon case is not for you. That said, it is a carry on and since you are in charge of it, should not be nearly as damaged as it might be on long flights.